Featured / Recipes / 23.09.2017. Croatian region of Gorski kotar is rich in various venison. Hence it was often found on manor tables where annual hunting parties were arranged for the selected persons. According to the old recipes, venison would be placed in brine in order for meat to soften, but also for it to lose it strong flavour particular for venison. The marinade is also used in preparation of sauces and it provides the finishing flavour to the meal. 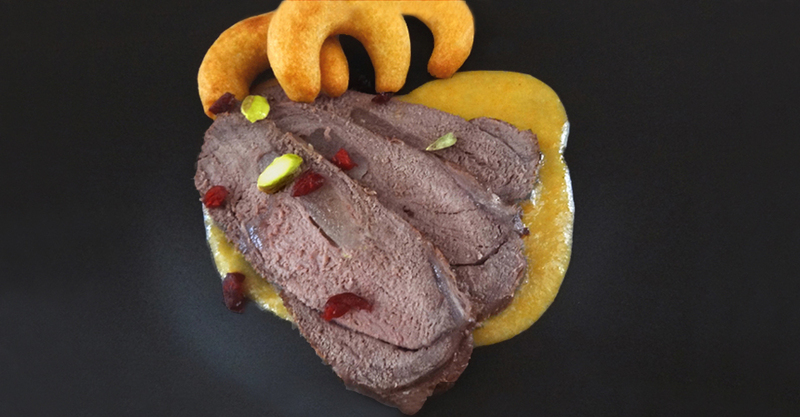 Serve the deer chops in sauce with potato croquettes or bread dumplings. Clean and slice the carrot, celery and parsley and cooking in water with added seasonings. Cook it all together, and then let cool. Cover the meat with brine, wrap in plastic foil and leave in refrigerator for 3-4 days with occasional turning. Cut the bacon to sticks and place briefly in refrigerator. Remove the meat from the brine, dry and cut the incisions along the length of the fibers and insert pieces of bacon. Salt the meat mildly. On the third of the well heated lard bake the meat on all sides. Put the other third of the lard in the baking pan and place the baked meat. Bake in the oven previously heated to 170 ˚C for 40 minutes. During roasting pour with gravy. Let stand for about 10-ak minutes. Strain the brine. Toast the flour on the remaining heated lard until it turns yellow. Pour with some brine, add vegetable and lemon rind. Cook for about 15-ak minutes. During cooking pour the vegetable with brine. In the end chop it all together in a blender. Cut the meat in steaks, cover with sauce and serve with potato batter croquettes.